First, who are these Garagistes and where do they get off? And didn’t I hear they were dead? We sully the fine pages of Fine Cooking Magazine and stir it up in the pages of Mix Magazine. Lastly, mourn with the Moody Blues as they appear to lament the end of a Les Garagistes harvest. Thanks much for stopping by. Our 2017s are gently aging in the cellar, and another exciting vintage is just ahead. Hope you can join us for it, and let us know what you think of what we’ve cobbled together. A little vegetal back in there somewhere, but surprisingly excellent overall. Bricky color, but still lively. There’s something astringent and/or tannic running along the base, but pretty nice for 12! Drink Soon. GW: Holding up well. Elegant. Engaging. Mellow. Fruits fading with dignity. Odd and pungent dill, almost American Oak smell dominate nose. The fruit is okay in the mouth, but they give way to old tannins pretty quickly. A LOT of sediment. Past Prime. GW: A little thin and old but steady, smooth. Fruits linger in the finish. GW: Getting old but still engaging. Good balance and length. Mature and elegant. It still has a beautiful nose! Violets, and very Franc-driven. Great finish, beautiful and still full of life. This one has aged VERY gracefully. Perfect now. GW: Good nose, impressive flavors. A little old in the finish, but lingers nicely. Not much nose but beautiful in the mouth. Lean, and *definitely* showing its age, but good structure/bones. Good, but on its way down. GW: Minor nose. Bright and lively. Fun fruit, good acidity. Steady presence on the palate. Nice, reasonably approachable nose. Luscious, some chalky cocoa, a good finish. Decent acidity, tannins could keep it around for a bit. Drink now. Mature nose, floral with a good dose of oak. Rich and full in mouth, very approachable. Not a super long finish, but not too bad, either. The character of this P is defined by its oak, for better or worse (mostly better). Drinking great right now. GW:Very approachable, lovely fruit, low acid, short finish. Full rich nose, with deep ripe fruit and beautiful in the mouth but almost instantly, it disappears/drops off. Really odd. GW: Good but weaker than the 2013. Poor finish. Maybe a tad unripe in the nose somehow. Real Bordeaux character about it. Full, good balance, length. Not hugely ripe, but that’s balanced by lots of character. Drink now. Tight, angular, good acid. Much less approachable than the 2015. Needs 2 years? Smells approachable, tho you can also smell the alcohol. A little dead in the mouth right now, but has a decent finish. Maybe a year away. Looks like our Roussanne is coming in for a landing, so I’ll be heading east to pick it up – and taste through our other varietals – on Wednesday. A round of applause, please for the Garagistes who bravely shouldered the burden of trialing this out last weekend. I think we had a great group: lots of discussion, good ideas from everyone, and collegial differences of opinion. We’ve done blending trials like this since 2006, the first Peugeot, but every year I’m amazed we actually get something we like – and with pretty much unanimous consent. This year was no different. The Cab Franc had a higher than normal acidity, as well as more alcohol than we’d like, so right away the lynchpin of every Peugeot was in question. 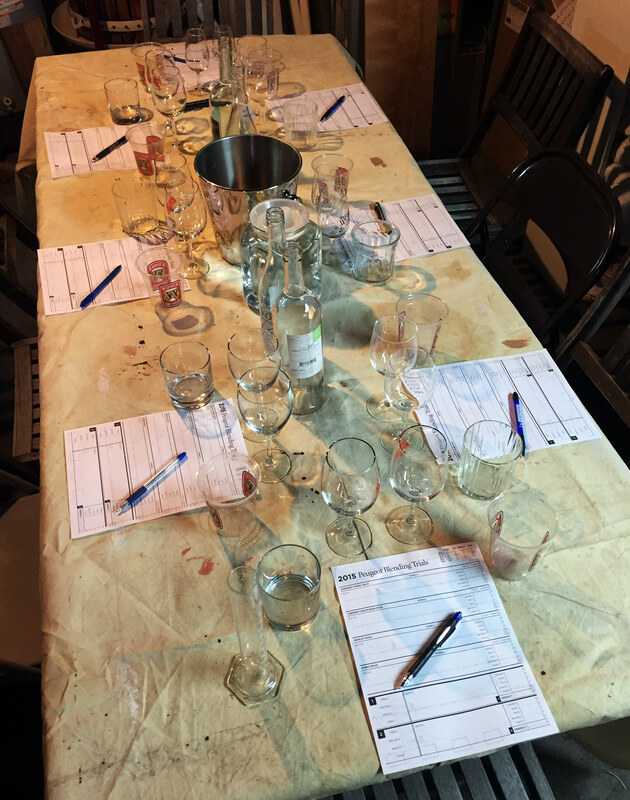 After tasting through the component wines individually, we waded into blending, but after 2 blends I found myself wondering if we’d ever wrangle these distinct personalities into balance. 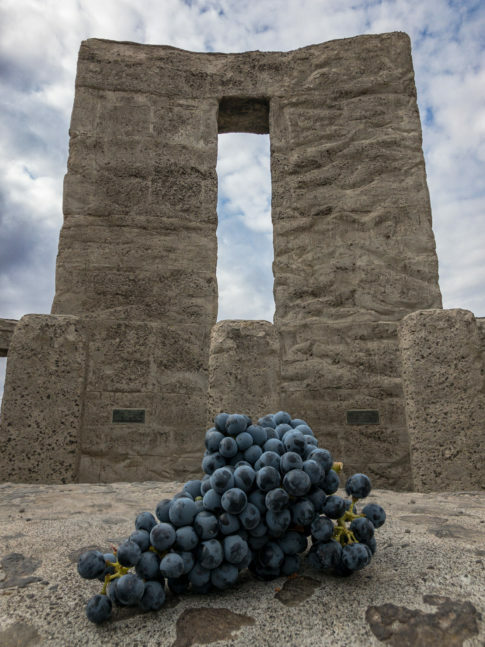 But again, I shouldn’t have feared: by the 4th blend – not coincidentally when we started adding Syrah into the mix – things were starting to fall into place. To me, it was a question of controlling the acidity the Franc brought to the table, getting the right (but not too much!) amount of fruit (via the Merlot and Syrah), and controlling the amount of tannin throughout (largely the Cab Sauv’s contribution, in addition to weight in general). Anyway, the final wine kind of knocked our socks off. It’s really got a lot going on in the mouth – lots of things firing at once, but in concert – and it smells heavenly. Check out our much-spiffier vintage note page, which not only features better lozenge-icons, but on click of same, recent tasting notes by card-carrying Garagistes to better guide the opening or holding of our wines. This thing is ready. What was increasingly bitter and awkward tannins have, like a caterpillar, transformed into a smooth, silky butterfly almost overnight. There’s still some EA in the cap, but since EA is a surface dweller (it needs oxygen to survive), we scrape off the top 1-2″ before press. Then we let the free run drain from the bottom of the fermenter before shoveling out the grape must into the press, setting it aside so that even if the pressed grapes are still stained with a bit of EA, we’ll at least have clean, lovely free run. But as far as we can tell as the actual press progresses, we’ve scraped off any compromised fruit: this stuff tastes and smells fantastic! As of today, we’re approx 28-32 days out from sealing the Cab away. So now that we’re close to our guess about when it’ll turn, we need to start really paying attention. 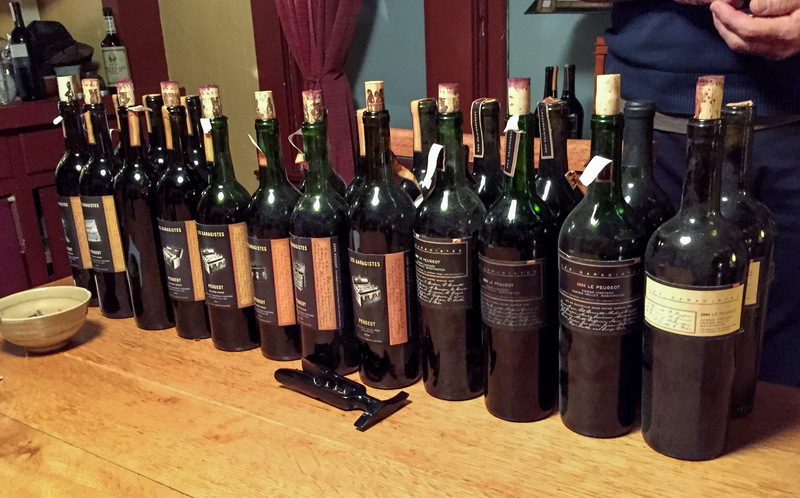 Of course, we’ve been tasting/smelling the Cab every 4-5 days. We’re getting some EA on the surface – a little disturbing, for sure – but a stern talking to with argon and sulfite sprayed over the cap seems to have really knocked it to its knees. In fact, when we bellows’d the plastic this morning, it actually smelled close to pretty straight. And the wine itself, below the cap, continues to be totally clean. But it has been changing — today it had evolved more of a planty, stemmy aspect, something we both felt was interesting (that is to say, not a defect). Maybe a bit more richness.